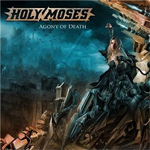 Long before Angela Gossow joined Arch Enemy Sabina Classen had been growling for Holy Moses, maybe the first death/thrash band fronted by a female. The German thrashers have been around since 1986 and have recently released their latest work, 'Agony Of Death,' the twelfth album in their catalog. The band has undergone numerous lineup changes throughout the years, regrettably the one constant in the band is Classen, who might be the worst extreme vocalist on the planet. I'll be the first to admit that this isn't particularly my favorite type of singing, but Classen brings her art to all-time low on 'Agony Of Death.' It's hard to tell if the vocals were recorded conventionally or if someone just followed her around and taped her dry heaving after a three-day drinking binge. My money would be on the latter. There are some decent chops on display here and I liked most of the instrumental portions of the songs, but the growling is almost unbearable. The best thing I can say about this CD is that Holy Moses almost got the title right. If they called it 'Agony Of Death Metal' they would have nailed it. It's understandable that a band would want a pretty female on stage with them. That will always draw more guys to their gigs. But Holy Moses obviously doesn't understand that she has to be able to sing too. They'd be better off using Classen as a dancer, or anything else, just get that microphone away from her! The best thing I can say about this CD is that Holy Moses almost got the title right. If they called it 'Agony Of Death Metal' they would have nailed it. It's understandable that a band would want a pretty female on stage with them. That will always draw more guys to their gigs. But Holy Moses obviously doesn't understand that she has to be able to sing too.